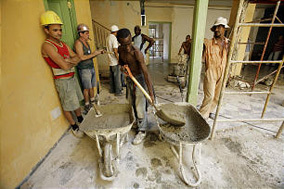 Cuba may have to trim bloated work force | Cuba Headlines – Cuba News, Breaking News, Articles and Daily Information HAVANA — At a state project to refurbish a decaying building in Old Havana, one worker paints a wall white while two others watch. "> HAVANA — At a state project to refurbish a decaying building in Old Havana, one worker paints a wall white while two others watch. HAVANA — At a state project to refurbish a decaying building in Old Havana, one worker paints a wall white while two others watch. A fourth sleeps in a wheelbarrow positioned in a sliver of shade nearby and two more smoke and chat on the curb. President Raul Castro has said the nation lately, about one in five Cuban workers may be redundant. At the work site on Obispo street, those numbers run in reverse. It's a common sight in Cuba. Here, nearly everyone works for the state and official unemployment is minuscule. Now, facing a severe budget deficit, the government has hinted at restructuring or trimming its bloated work force. Details are sketchy on how and when such pruning would take place. Still, acknowledgment that cuts are needed has come from president Raul Castro himself.